Before you get to Myanmar, you’ll probably do a bunch of Internet research. One of the foremost pieces of shared wisdom is the need to bring crisp US dollar bills in high denominations. Fortunately the situation is rapidly improving, and I thought I would share my insights into the world of Myanmar money. In my group we shared recommendations amongst ourselves how much cash we would take along. As we had almost all booked our hotel through an agency, using credit cards, the bulk of our travel was covered before we left home. So people were planning to bring along $300 to $1000, changing the money as they went depending on what they needed or were tempted to buy. The airport at Yangon had two money changing places and an ATM (as of June 2013). The rate posted in the airport was better than the rates I had seen on the Internet ($1:938 instead of $1:838) so my little travel group all changed the money there. There were no transaction fees, so our attempt to save money by bulking together our cash made no difference at all. Once in town, you realize that there are two separate worlds: foreigner world and local world. In foreigner world, the prices are the same as most major cities. The Trader Hotel charged a meaty $11 for a salad, for instance. And yet, out on the street, most items cost $1 or less. My friend Nik and I had the most incredible, massive BBQ meal in China Town for $26, including beers and food for our two friends. Drinks in the bars were $3 or $4. Sometimes they would deny that they served anything apart from beer and red wine. And, sometimes, they were not lying. 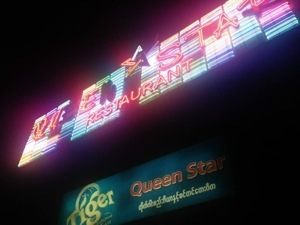 We were in Queen Star, a rather weird singing bar, and their red wine came in an airplane style bottle and tasted of grape fizz (not a good thing). Nowdays it seems that you can totally ignore the money changers. They hang out around the main hotels and tourist places, whispering to you as you walk past. I can see these guys (they are all guys) being out of business within a year. The recommendation on crisp dollar bills is mostly true. The hotels I visited all changed money at a fair rate, and most were ok with bills in decent condition. For some reason though, I had ended up with a $100 bill that seemed to have been blood-splattered from some ATM machine. 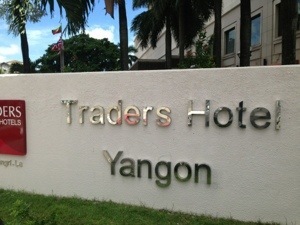 That one still sits in my rucksack, unloved by every hotel and bank in Myanmar. It does make sense though, as the banks they need to use to process the money would not accept it either. The great news is that ATMs are spreading. There were two at the Pagoda in Yangon (only one working, but the other looked like it just needed another few days to be set up). I used one in the MICC convention center, a slightly off-putting experience as the first time I used it I only extracted 20,000 (about $20), until I realized that the absence of zeros on the options was deliberate and I needed to click on other. In the end money in Myanmar works out just fine. Slightly strange, but nowhere near the headache I was expecting. They even have new notes coming out to make transactions easier, like the sparkling new 10,000 note. It was so special that one of my Yangon friends even swapped me two 5,000s to get hold of one. It’s a new world! Hi Mark, I’m sure you knew when you wrote this that the “$100 bill that seemed to have been blood-splattered from some ATM machine” was likely to be a note that had been in an ATM (or cash-in-transit) with a banknote neutralization system. If the note is ‘stolen’, the ink is meant to show the money to be the proceeds of crime. Doesn’t work too well outside places like Myanmar, where they know what to avoid . . . I did not jump to that conclusion – and definitely not the follow-up conclusion that people in Myanmar were smart to this. On the contrary – they had hardly seen any functioning money and were looking in glee at the brand new local currency I had. A Gorbatchev-style blog in the middle of the note might be a characteristic of a stolen note… I’m not the expert though!